Located ON the Boise Greenbelt! Right across from Barber Park and down the Greenbelt from Marianne Williams Park. Steps away from Trout fishing on the Boise River. 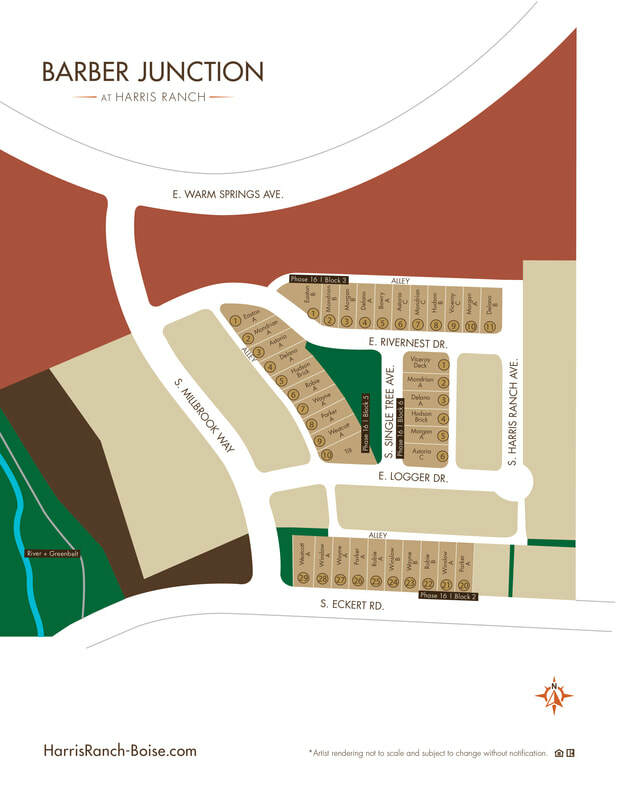 Barber Junction is one of the newest phases within Harris Ranch Master Planned Community. Similar to the Mill District, Barber Junction feature both large single-level and three-story units. Most of the homes here offer a smaller footprint homesite than others in the neighborhood, but still include all the amenities homebuyers expect to find in Harris Ranch. The allure of The Wildflower floorplan will be clear the moment your eyes catch this charming 2,123 SqFt home. With the master on the main level this 3 bedroom, 2.5 bathroom home feels very spacious. Productivity will be a cinch with the included tech center, spacious enough for any project. Other features include a large kitchen island, gas range, and a large upstairs loft area. Home is staged and move in ready. Photos similar. Some items subject to change. The allure of The Wildflower floorplan will be clear the moment your eyes catch this charming 2,123 SqFt home. With the master on the main level this 3 bedroom, 2.5 bathroom home feels very spacious. Productivity will be a cinch with the included tech center, spacious enough for any project. Other features include a large kitchen island, gas range, and a large upstairs loft area. Mid June 2019 completion. Photos similar. Some items subject to change. Beautiful home steps away from the Boise Greenbelt! Right across from Barber Park and a short Greenbelt walk from Marianne Williams Park. Walk or bike to Lucky 13 Pizza and Lucky Peak Reservoir. Home features beautiful finishes throughout & the perfect floor plan. Spacious living area downstairs opens to beautiful kitchen & dining space perfect for entertaining. Upstairs features a sizable family room style loft which is a great area for the kids. Oversized master suite and master closet do not disappoint!